Singapore Science Centre - Marvel Avengers S.T.A.T.I.O.N. Take on the role of recruits, be part of a combat support network for the Avengers, and explore the history and scientific origins of your favourite Avengers including Iron Man, Hulk, Captain America and Thor. Visitors enter as recruits and are granted probationary status with the objective of experiencing and learning the world of the Avengers, by carrying out detailed examinations of the History, Genetics, Technology, Mission and Personal Profiles of the Avengers team. Before entering the exhibition, all recruits are advised to download the AVENGERS S.T.A.T.I.O.N. MOBILE TRAINING DEVICE application on their mobile phones. The application is available for free in the App Store and Android Google Play. Recruits, are you ready? You are about to receive your mission brief from Agent Maria Hill. Once your App is loaded and ready, you will be guided through your training by Tony Stark’s Artificial Intelligence - F.R.I.D.A.Y. The app will give you access and insight into every exhibit, so keep it handy during your visit. Now let’s begin. The first Avenger, Captain America, was recruited for the Super Soldier program because of his strength in character. Here you will learn about the resulting physiological enhancements from Dr. Erskine’s program. Learn about vibranium and its scientific properties, then test the shield yourself. Or hop on Captain America’s bike to continue the adventure. What do Captain America and the Hulk have in common? The Super Soldier Serum. Learn how the Super Soldier Serum works and its effect on Hulk’s blood. Watch the Hulk come alive through an interactive live screen display. What goes on in the Hulk’s mind? Learn about the brain and the neurological changes that he experiences. Witness and study the electromagnetic spectrum readings emanating from the Tesseract as the S.T.A.T.I.O.N. attempts to reopen the portal. We trust you, recruit. Here you may delve into the personnel files of The Avengers members and inspect their uniforms. ﻿Ant-Man’s suit and revolutionary helmet on display. There are even light simulations of ants on the floor! A good agent always knows his enemies. Learn more about Chitauri, the Dark Elf and Loki through these displays. Here you will also find Loki’s Asgardian robes. Discover the scientific theory that allows Bifrost transport Thor from Asgard to Midgard (Earth). Learn about the Dark Matter and how it relates to the Dark Elves. Find out the isotope detected in Thor’s hammer through the accelerated mass spectrometer. Take a closer look at Thor’s warrior garments and helmet. Are you worthy, recruit? Why not try lifting the Mjölnir? Legend says that only Thor and Vision are known to be able to control this hammer. Explore the entire universe on a giant interactive screen using NASA’s latest computer technology, Eyes On ExoPlanets. Scroll through stars that are millions of light miles away, or venture into the wondrous Marvel solar system and visit faraway planets. It’s time to test your flight skills, recruit. Put on Iron Man’s suit in augmented reality and get set, jet! Study Iron Man’s collection of MK 1-7 Suits and learn more about their capabilities through this interactive exhibit. Some interactive games for the family include colouring of superhero cut-outs and making of superhero keychains. At this final stage, team up with fellow visitors and take on the roles of The Avengers to battle villains in an interactive game. Marvel Avengers S.T.A.T.I.O.N. is located at Annex Hall and will run from 29 October 2016 to 05 March 2017. Tickets are priced from $18 for Children, and $25 for Adults. Tickets are available at SISTIC www.sistic.com.sg/events/cmarvel2017 and more information is available at www.science.edu.sg/exhibitions/Pages/AvengersStation.aspx. Science Centre Singapore’s (SCS) Omni-Theatre, Southeast Asia’s first 8K 3D Dome Theatre, launched its inaugural 3D Digital Dome movie today. A first in the region, the animated film Natural Selection 3D tells an immersive tale of renowned naturalist Charles Darwin’s scientific journeys around the world on the HMS Beagle, his discovery of the evolution of life on Earth and his theory of natural selection. Natural Selection 3D is now available to members of the public, and is targeted at those aged 10 and up. Tickets for all shows are priced at $14. For more information, visit www.science.edu.sg. 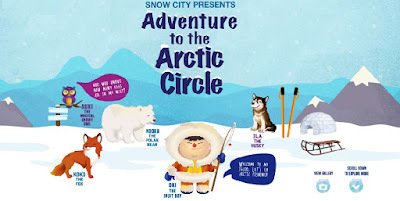 Snow City offers educational programmes that are all conceptualized in the context of low temperatures (from -196°C to 0°C). For this Christmas season, there are exciting yuletide themed decorations. For the young ones, there are even gentler slides and snow toys for them. For more information, visit www.snowcity.com.sg.